I’m trying to make maxi skirts my thing again. I used to wear the one that I have ALL the time. But since I got a big girl job a year ago, my carefree-maxi-skirt-wearing days are over. For the most part anyways. My one go-to skirt is a super funky purple tribal print which is really not work appropriate. 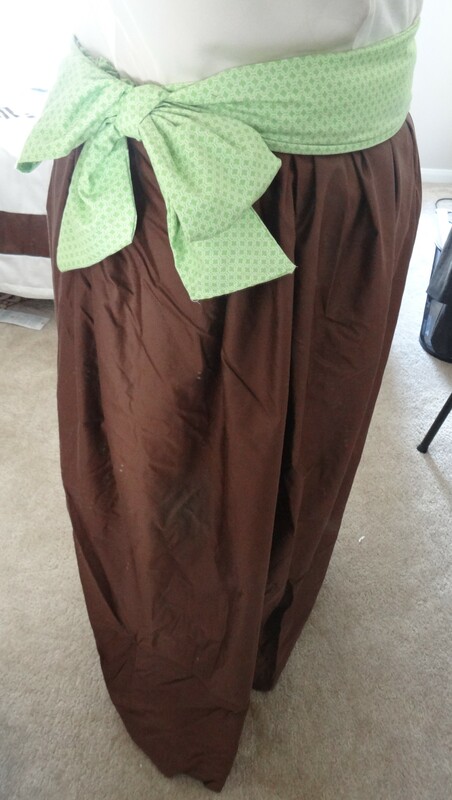 So, from an old bed sheet I created a full and flowy skirt that I could wear to work if I wanted to. I started by placing my skirt on the sheet and cutting around it like a pattern. I strategically placed it at the (what would the the top/fancy) seam of the sheet so I would cut out on my sewing time. I cut it a little big too large that way I knew I wouldn’t have problems walking in it. I put the right sides together and sewed the side seams to the top. I measured the width of the skirt and cut four strips of the printed fabric to form a band. Doing this twice, place the right sides of two of the pieces together and sew just across one of the widthwise sides. Laying them flat to where they are unfolded, sew the two pieces together on the lengthwise sides to form a band. Now, with the right side of the sheet and the right side of the fabric, sew completely around leaving about a two inches of space for the elastic. To measure the elastic, pull it tight against where you want it to sit and cut. Feed elastic through band. Sew the ends of elastic together and sew the band the rest of the way around. I made the sash next. For the full 1 1/4 yard of fabric, cut four strips however wide you would like. Use the same method as the band of the skirt. Instead of sewing it to the skirt just sew the other side shut and sew the ends together after it is right side out. And you’re done! It took me about and hour and a half to do because I was making it up as I went but it turned out really well! I will probably wear this to work with a crisp white dress shirt and a statement necklace.